The United States District Court for the Western District of Tennessee (in case citations, W.D. Tenn.) is the Federal district court covering the western part of the state of Tennessee. Appeals from the Western District of Tennessee are taken to the United States Court of Appeals for the Sixth Circuit (except for patent claims and claims against the U.S. government under the Tucker Act, which are appealed to the Federal Circuit). The jurisdiction of the Western District of Tennessee comprises the following counties: Benton, Carroll, Chester, Crockett, Decatur, Dyer, Fayette, Gibson, Hardeman, Hardin, Haywood, Henderson, Henry, Lake, Lauderdale, Madison, McNairy, Obion, Perry, Shelby, Tipton, and Weakley. The court's jurisdiction includes the entirety of West Tennessee, plus Perry County in Middle Tennessee. This area includes the cities of Jackson and Memphis. The United States Attorney's Office for the Western District of Tennessee represents the United States in civil and criminal litigation in the court. The current United States Attorney is D. Michael Dunavant. The United States District Court for the District of Tennessee was established with one judgeship on January 31, 1797, by 1 Stat. 496. The judgeship was filled by President George Washington's appointment of John McNairy. Since Congress failed to assign the district to a circuit, the court had the jurisdiction of both a district court and a circuit court. Appeals from this one district court went directly to the United States Supreme Court. On February 13, 1801, in the famous " Midnight Judges" Act of 1801, 2 Stat. 89, Congress abolished the U.S. district court in Tennessee, and expanded the number of circuits to six, provided for independent circuit court judgeships, and abolished the necessity of Supreme Court Justices riding the circuits. It was this legislation which created the grandfather of the present Sixth Circuit. The act provided for a "Sixth Circuit" comprising two districts in the State of Tennessee, one district in the State of Kentucky and one district, called the Ohio District, composed of the Ohio and Indiana territories (the latter including the present State of Michigan). The new Sixth Circuit Court was to be held at "Bairdstown" in the District of Kentucky, at Knoxville in the District of East Tennessee, at Nashville in the District of West Tennessee, and at Cincinnati in the District of Ohio. Unlike the other circuits which were provided with three circuit judges, the Sixth Circuit was to have only one circuit judge with district judges from Kentucky and Tennessee comprising the rest of the court. Any two judges constituted a quorum. New circuit judgeships were to be created as district judgeships in Kentucky and Tennessee became vacant. The repeal of this Act restored the District on March 8, 1802, 2 Stat. 132. The District was divided into the Eastern and Western Districts on April 29, 1802. On February 24, 1807, Congress again abolished the two districts and created the United States Circuit for the District of Tennessee. On March 3, 1837, Congress assigned the judicial district of Tennessee to the Eighth Circuit. On June 18, 1839, by 5 Stat. 313, Congress divided Tennessee into three districts, Eastern, Middle, and Western. Again, only one judgeship was allotted for all three districts. 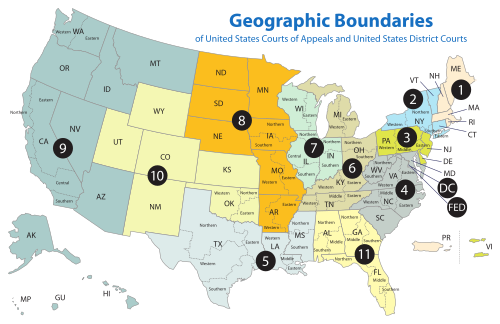 On July 15, 1862, Congress reassigned appellate jurisdiction to the Sixth Circuit. Finally, on June 14, 1878, Congress authorized a separate judgeship for the Western District of Tennessee. President Rutherford B. Hayes then appointed Eli Shelby Hammond as the first judge for only the Western District of Tennessee. There are now five permanent judgeships and four magistrate judgeships for the Western District of Tennessee. 9 John Donelson Martin Sr. TN 1883–1962 1935–1940 — — F. Roosevelt appointment to 6th Cir. 11 Bailey Brown TN 1917–2004 1961–1979 1966–1979 — Kennedy appointment to 6th Cir. 13 Harry W. Wellford TN 1924–present 1970–1982 — — Nixon appointment to 6th Cir. 15 Julia Smith Gibbons TN 1950–present 1983–2002 1994–2000 — Reagan appointment to 6th Cir. 19 Bernice B. Donald TN 1951–present 1995–2011 — — Clinton appointment to 6th Cir. The U.S. District Court for the Western District of Tennessee is based out of two courthouses, the Clifford Davis Federal Building on 167 North Main Street in downtown Memphis and the Ed Jones Federal Building in Jackson, Tennessee. ^ a b c Asbury Dickens, A Synoptical Index to the Laws and Treaties of the United States of America (1852), p. 391. ^ a b c d U.S. District Courts of Tennessee, Legislative history, Federal Judicial Center. ^ The Honorable Harry Phillips, "History of the Sixth Circuit Archived January 11, 2007, at the Wayback Machine". ^ Alfred Conkling, A Treatise on the Organization, Jurisdiction and Practice of the Courts of the United States (1842), p. 42. ^ "Listing Of Past And Current United States Attorneys". Department of Justice.